The worker must have bread, but she must have roses, too. Help, you women of privilege, give her the ballot to fight with. Comments on: "Rose Schneiderman Quotes: The worker must have bread, but she must have roses, too. Help, you..."
You have nothing that the humblest worker has not a right to have also. After I had been working as a cap maker for three years it began to dawn on me that we girls needed an organization. The men had organized already, and had gained some advantages, but the bosses had lost nothing, as they took it out on us. By working hard we could make an average of about $5 a week. We would have made more but had to provide our own machines, which cost us $45, we paying for them on the installment plan. We paid $5 down and $1 a month after that. All the time our union was progressing very nicely. There were lectures to make us understand what trades unionism is and our real position in the labor movement. I learned the business in about two months, and then made as much as the others, and was consequently doing quite well when the factory burned down, destroying all our machines – 150 of them. This was very hard on the girls who had paid for their machines. But every time the workers come out in the only way they know to protest against conditions which are unbearable the strong hand of the law is allowed to press down heavily upon us. 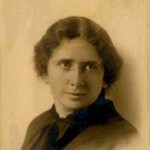 Rose Schneiderman was a prominent United States labor union leader, socialist, and feminist of the first part of the twentieth century. She is credited with coining the phrase "Bread and Roses", later used as the title of a poem and set to music and interpreted by several performers. 1906 - William Joseph Brennan Jr.